Markus Tozman, a graduate student of the Middle East at Johns Hopkins University SAIS, did research work in Cairo from 17 June until 16 August 2013. His views, contained in the essay below, are the product of information gathered from interviews, the media and the impressions of the people he met on Cairo’s streets. “The king is dead, long live the king!” It must be difficult for those outside Egypt to put into logical perspective the developments of the last two-and-a-half years. Egypt’s “Arab Spring” revolution was followed by political instability that led to another revolution on 30 June 2013. The results of these revolutions are a frightening state of instability that bodes ill for the future of Egypt. At the beginning was the 25 January 2011 revolution that led to the ousting of President Mubarak who had led Egypt’s fortunes for 30 years. Widespread discontent with the economic situation, a widening gap between the rich and the poor, corruption, nepotism and a lack of prospects for a youth (under 25) that makes up more than half of the Egyptian population, led tens of thousands of Egyptians to demonstrate against their President. Mubarak’s days were numbered and it was because of the youth that he was toppled. Liberals and Christians were the drive behind the revolution and Egypt’s biggest non-state institution, the Muslim Brotherhood, initially refrained from partaking in the protests. It was only in the last phase of the revolution that a few of its elders joined the protest, but they had only a negligible role. Because of its history and the several government crackdowns it had faced, the Muslim Brotherhood was cautious and did not believe in the success of the uprising. Nevertheless, the army, which has always been the backbone of any regime in Egypt’s recent history, had lost confidence in Mubarak and sacrificed him to please the crowds. 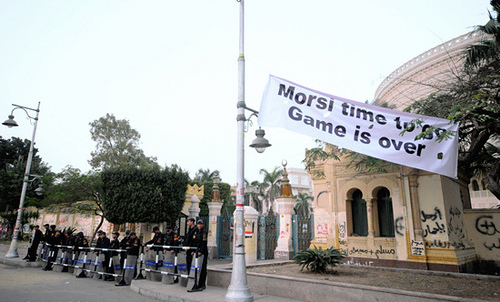 Mubarak was overthrown. With the results of the parliamentary elections in 2012, several observers argued that the Muslim Brotherhood had, a year later, hijacked the revolution. Brotherhood members, they argued, did not go onto the streets to oust President Mubarak, but by using their strong network and their financial influence, they won the elections of the Egyptian Upper and Lower Houses by a landslide majority of 45%. The second biggest party was the Salafist Al-Nour party that gained another 22%. Coalescing, both parties had a two-thirds majority (1). The Presidential elections followed in June 2012. As Gehad el-Haddad, spokesman of the Muslim Brotherhood, told me in an interview, the Muslim Brotherhood initially vowed not to participate in the Presidential elections for the sake of public unity. “But because there was no capable candidate and we saw the country falling into the hands of the old regime, we saved Egypt by fielding Morsi. Otherwise the old regime would have won” (2). Morsi won with 52% against Ahmed Shafik, a representative of the old regime. Morsi did not win because of widespread support for the Muslim Brotherhood but because of the animosity Egyptians still had towards the old regime. Many Egyptians reported that they were willing to give the Brotherhood a chance, because they felt that they did not have another choice; there was only one counter-candidate and he was a representative of the old regime against which the Egyptians were fighting in the first place. Once in control of the legislative and executive branch, however, the Muslim Brotherhood failed to implement a national consensus policy. Roughly speaking, the 2011 revolution was staged for more political freedom and because Egyptians wanted their economic situation to improve. Instead of addressing these issues, the Brotherhood purged the state institutions and Ministries. The one-year tenure of the Brotherhood made it abundantly clear that the ruling party’s agenda was not consensus-based. Polarisation was on the rise: a mentality of “either you are with us, or you are against us” was promoted by the Muslim Brotherhood. To give some examples: Egyptians reported that they felt a tremendous pressure to veil or grow beards and wear jalabiyyas (the long, traditional Muslim gown). Those who did not could face harassment on the street. Beyond that, more than 40 trials for “insults against Islam” were started against Christians within the two-and-a-half years after the revolution. This charge was almost non-existent before the revolution (3). Yet the beginning of the Brotherhood’s fall was probably 22 November 2012, the day President Morsi gave himself, by Constitutional declaration, “the powers to issue any decision or law without any alternative authority in the country having the power to oppose or revoke it” (4). Simultaneously, he declared that the judiciary had no right to dissolve either the Shura Council (Upper House) nor the Constitutional Assembly (tasked to write a new Constitution), both of which were dominated by Islamists. By taking these steps the Muslim Brotherhood and the President placed themselves above the judiciary and there was no controlling body left, since the Lower House had already been dissolved. Egypt was on its way to another dictatorship. Yet, the causes of the revolution of January 2011 were still not addressed politically because the Brotherhood was focused only on safeguarding its own position. The economy was ailing, inflation running high and the informal labor sector had increased to far more than 50% in 2012 (5). Morsi’s inept behaviour as President, rising sectarian violence against Christians and Shia Muslims (6), a general growth of public disorder, violent clashes between Morsi supporters and opponents and a feeling of alienation in one’s own country (7) led to the resistance of more and more Egyptians, and eventually also to the foundation of the Tamarod (Rebel) movement in April 2013. The movement collected 22 million signatures from Egyptian citizens demanding the resignation of Morsi, although they did not have any legal basis to enforce this step. Millions went onto the streets on 30 June to voice their demands. However, the Brotherhood refused concessions and Morsi did not reconcile sufficiently with the population’s demands. The army stepped in and announced “the people’s revolution”, highlighting that this was not a military coup d’état because it was “the will of the people” and the army only fulfilled that will. Minister of Defense Sisi, head of the armed forces, declared this on television and he was supported by the Grand Sheikh of al-Azhar, (head of the Hanafi Branch of Islam), Pope Tawadros (head of the Coptic community) and other society representatives. The consequences for the Christian community were felt immediately. They were reportedly denounced by the Muslim Brotherhood for being solely responsible for the overthrow. Being in a much more precarious situation in the countryside, they fell prey to several sectarian attacks, such as in Minya, leaving dozens of Christian houses and shops burnt to the ground (8). Although liberals and the highest authority of the Hanafi Islamic branch supported the coup (as well as the Salafist Al-Nour party, the Brotherhood’s former coalition partner), the Brotherhood could not as easily agitate crowds against’ these groups as they could the Christian population. Christians were an ideal scapegoat because they could be designated easily as the “malevolent other” in the eyes of the ill-educated and poor rural population. Even before Morsi’s overthrow, Christians had already been threatened that they should stay at home on 30 June or face dire consequences. Yet the worst for them was still to come. The ousting of Morsi opened up a whole range of political possibilities. Even without him, Egypt could have embraced the Brotherhood, believing it could yet finally take consensus-based decisions for the future of Egypt. Yet once the opposition had the power, they refused to conciliate the Brotherhood. The longer the sit-ins of the Brotherhood dragged on, the less patient Cairo’s citizens became. The society had reached such a high level of polarisation that it felt as if they wanted to take revenge on the Brotherhood for their year in power. Several people on the streets bluntly told me: “We have a problem, indeed, and that is the Brotherhood. We have a solution, too: we could just wipe them from the streets with our army”. To gain the necessary legitimacy for that, the army called upon the Egyptian people to take to the streets again, to show their solidarity with the army and to protect the revolution from the threat of the Brotherhood. In other words: the army asked the population for a blank cheque to use a heavy-handed approach against anyone who was “against the revolution”. Egyptians followed suit. Attending these protests, I observed crowds who embraced and idealised the army as protector of the people and the revolution. Sisi was compared with the great Egyptian hero Nasser, and people demanded a strong and powerful army to save Egypt from its demise. This scene was really rather disturbing, because it showed that Egyptians had completely lost sight of the developments in their country. Many were blinded by sheer hatred of the Brotherhood and turned paranoid (9). It seemed that they had forgotten about the initial aims of the January 2011 revolution: they wanted to shake off the old regime and to live a more prosperous life with more political freedom. That demonstration, however, showed me that these initial aims were not in their interests anymore. They were willing to sacrifice all this for the sake of disposing of the Muslim Brotherhood. The army understood its mandate and took power into its hands completely. On 14 August the army ordered the brutal dispersal of the Brotherhood’s sit-ins in Cairo whereby more than 1000 protestors, medics and journalists were killed, according to Al Jazeera. The accurate numbers are unknown because the army forbade the Health Ministry to publish the death toll but it is likely that there were far more than 1000 victims on 14 August alone. Journalists were shot at because they were allegedly biased against the regime, or part of the international media that allegedly wanted to tarnish Egypt’s reputation. A few hours later a state of emergency was declared and a curfew imposed on several governorates and cities all over Egypt – I observed Egyptians on the streets cheering that decision. I observed crowds who embraced and idealised the army as protector of the people and the revolution. Sisi was compared with the great Egyptian hero Nasser, and people demanded a strong and powerful army to save Egypt from its demise. What followed were the worst forms of sectarian violence against Christians in Egypt in more than a century. Within 48 hours after the dispersal, 61 churches, 58 houses and 85 stores belonging to Christians were attacked and destroyed (10). Since the Muslim Brotherhood had announced retaliatory attacks in case of a military crackdown, it is highly likely that the army expected attacks against Christians. Yet, I have not found one account reporting that the army intervened to protect its Christian citizens. I suspect that the images of burning churches and rioting Muslim Brethren were acquiesced in, to say the least, to create a strong public sentiment against, and understanding for, the army’s heavy-handed approach towards the Muslim Brotherhood. Politically speaking, these events secured the power of the army. Strong opposition figures like Mohammed el-Baradei resigned after the crackdown against the Muslim Brotherhood. The Tamarod movement, with its 22 million supporters, has failed to materialise its influence politically and a third block of Egyptians who do not support either side exists but has not much influence (11). At this point there are no major political parties left that could gather enough votes to have a strong mandate. The army, one of the major economic entrepreneurs in Egypt (12), and the media seem to silence any sort of criticism against the army’s actions. Several foreign journalists have been detained without any official charge; a member of an Egyptian NGO that provides medical and legal care to the victims of human rights violations was arrested by the army after he publicly denounced the army, saying it was reviving the Mubarak regime (13); the army-backed government decided to ban the Muslim Brotherhood as an officially registered NGO (14). Freedom of speech seems to have become a matter of what the army will tolerate again. With no viable opposition in sight and with the majority of Egyptians, including the Christians, submissively supporting everything the army does, Egypt is facing a return to the same system they were fighting against for the last two-and-a-half years. Nationalism has always been ubiquitous in Egypt but it seems that jingoism is taking over. Some authors suspect the army promotes this nationalistic fervour as a cure against Islamism (15). If that is the case, Egypt would return to Nasser’s age. The connections between Nasser and Sisi are made consciously by the army and I have witnessed protestors as well as journalists placing Sisi in the same line as his predecessor. The Brotherhood, however, may come back. They have survived 85 years of persecution and suppression and will not falter now, although they have lost a lot of public support. As long as they have sufficient funds to pay off Egypt’s countless poor, they will always keep a certain influence and will be a destabilising factor in Egypt. Even with the detention of its leadership, the structure of the Brotherhood is still intact and will probably bring forth new leaders. 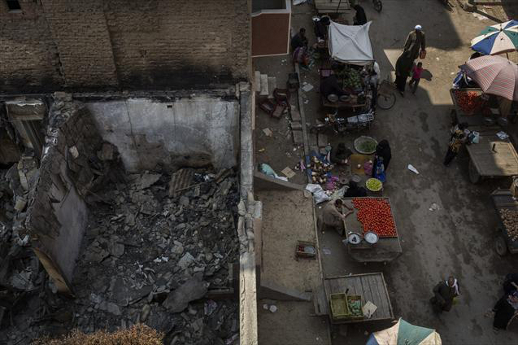 In this regard, other developments point to an Egyptian future that bodes ill in my eyes. On 5 September an attempt on the interior ministers’ life was made by unknown attackers (16). The parallels to the beginning of the 90s where Islamist fought the state in a long campaign, terrorising Christians and the population in the countryside, spring up immediately. Another indication that Egypt might end up in a long lasting terror campaign is the army’s heavy handed approach in the Sinai where it tries to crack down on militants, creating strong local resistance and hostility amongst the inhabitants of the Sinai (17). Retaliatory attacks by Hamas, one of the Brotherhood’s closest allies in the region, could follow as well. The army has decided to isolate the Gaza strip and create a buffer zone to dry out smuggler tunnels. Since the taxation of goods passing those tunnels is the main revenue for Hamas, they will have to take action against it or will lose power (18). With each terrorist attack, the feeling among Egyptians will grow that Egypt needs a strong army to save the country from falling apart. Even though the interim government still works on a new constitution, the handwriting of the army will likely be found in the document. The draft constitution bans religious political parties; another setback into the era of Mubarak where religious political parties were officially forbidden until his overthrow in 2011. It could also lead Salafis who are organised in political parties to join ranks with Muslim brethren to take revenge on the state (19). The situation of the Christians is even worse than before Mubarak’s overthrow. Pope Tawadros has clearly taken a position against the Brotherhood and diverted its wrath against the Christian community in Egypt. The attacks have not spared other denominations but were an all-out attack against the Christian populace. Although the army promised compensation for the burnt churches, some of which dated back to the fourth century AD (20), considering Egypt’s very poor track record of church building or renovating permits, it is possible that these announcements are no more than just a means to give Egypt’s Christians some vague hope to hold on to. Moreover, particularly the Christians in rural areas like Upper Egypt will endure suffering. It is the rural areas where the Muslim Brotherhood traditionally had a strong influence because they supported the poor population with food and money. Those Egyptians are easily suggestible and can be inflamed against Christians. Copts I have talked to, however, experience all this as a necessary evil they have to endure to have a bright future in Egypt. Nothing could be worse than the Muslim Brotherhood in power, they argue. If they have to be persecuted and killed, but can hope for a better future, they would not give up on Egypt. Sadly enough, the writing is on the wall already. The execution of a Coptic priest in the Sinai and the take-over of a village in Minya by Islamists (since removed by security forces) are indications of the short-term to mid-term future Christians in Egypt might face (21). The chances are high that the Islamists will take revenge on Christians in the countryside, in particular, where there is a weak military presence. One might question whether the Pope’s gesture to publicly side with the opposition was wise, but the Christians I have talked to were all standing with pride behind his decision. Still, it has worsened the Christians’ situation and they will be the Islamists’ main target, together with the army and the police, in the years to come. The attacks against Christians have reached such a worrisome level that even the big media outlets like Associated Press and the New York Times have reported on this (22). Yet, as has happened many times before, this attention was only short-lived and again withered away quickly. Despite the incredible rise in sectarian violence, the Christians in Egypt feel that they have achieved their goal and are still taken by their feelings of victory. If this feeling makes way for the reality Christians face in Egypt and if their position is not strengthened as result of the new constitution, they might emigrate in masses. At least the middle- and upper-class Christians I have interviewed have all some relatives abroad and could easily leave Egypt. Except for the lower-class Egyptians, none of my interviewees would face problems with the visa procedure. Many Egyptians reported that they see both 25 January and 30 June as two sides of the same coin; that the revolution started back then and was completed with the ousting of Morsi. I cannot but find this highly improbable. It rather seems to me, as a non-Egyptian, that 30 June has undone the work of 25 January. Nothing Egyptians have been fighting for has been achieved. The economy is still ailing, despite billion-dollar loans from countries overtly opposing the Brotherhood, like Saudi Arabia. The main source of foreign reserves, the tourism sector, has suffered tremendously and it will take years to regain the trust of tourists. The deteriorating security situation has cost investments and it is not likely that investors will soon return to Egypt. All in all, a rather disheartening perspective for the most highly populated country in the Arab world and even more so for the biggest Christian community left in the Middle East. 5. In an interview with an economics professor who is specialised in Egyptian labor market economics (06.08.2013), I was told that in 2012 more than 75 per cent of the Egyptian economy was based on informal employment (defined as employment without a contract or social insurance registration). The increase was due to the deteriorating economic situation. Employers were not willing to hire people with contracts anymore and the average citizen had to take several jobs to cover the rising living costs because of the high inflation. However, these numbers cannot be stated with absolute accuracy because of the nature of the informal economy and hence have to be read with caution. See also Maia Sieverding, A Life Course Perspective on Social Protection among the Working Poor in Egypt, Gender in Work in the MENA Region Working Paper Series, Number 24, September 2012. 12. Although definite numbers are nearly impossible to find, an economics professor that I have interviewed (06.08.2013) believed that the army had more than 40 per cent of the Egyptian economy in its hands.